The study aimed at assessing, as primary objective, the periapical status and quality of root fillings, and, as secondary objective, the endodontic treatment need of a German urban population in a cross-sectional study 20 years after the first one. Clinical and radiographic data of 353 patients were evaluated. Descriptive and regression analyses were performed and the endodontic treatment need was calculated. Results were compared with data from the year 1993. A total of 9269 teeth were examined (26.2 teeth per patient; 1993, 24.4), of which 337 teeth were root filled (3.6%; 1993, 2.7%). Prevalence of apical periodontitis in root-filled teeth was 34% (1993, 61%). 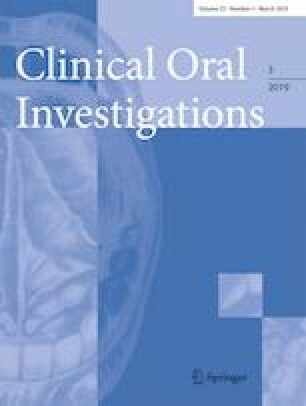 Quality of root fillings was adequate in 117 cases (35%; 1993, 14%). Minimum endodontic treatment need was estimated with 1.6% (1993, 2.3%), including teeth with clinical symptoms. Considering symptomless teeth with apical periodontitis and poor quality of root filling, the treatment need was 2.9% (1993, 3.7%). Regression analysis identified quality of root filling as a significant factor for periapical health (p = 0.01, odds ratio 3.4×, 95% CI 1.9–6.3×), likewise the type of instrumentation. Teeth treated with rotary files had a significantly better outcome (p = 0.02, odds ratio 2.0×, 95% CI 1.1–3.7×). Quality of root fillings and the periapical status have improved over the last 20 years in Germany. However, there is still a need for an increase in quality of root canal treatment. Rotary instrumentation and a good technical quality of root fillings were reliable predictors for periapical health. We would like to thank Carmen Buckley for the help with the manuscript. This article does not contain any studies with animals performed by any of the authors. Ethical approval was obtained by the local Research Ethics Committee (Nr. 412/2013 D). The study was performed in accordance with the ethical standards laid down in the 1964 Declaration of Helsinki and its later amendments.